Located conveniently at the crossroads of Manawagonish Road and Church Avenue, our West Side Saint John’s pizza delivery is located in the hometown of the 20th Annual Marathon by the Sea. Swing by and order a carryout pizza after visiting the Carlton Martello Tower, or order pizza delivery to your West Side Saint John’s home. Visit us in store or online to find your perfect specialty pizza match. We offer a number of delicious specialty pizzas delivered hot to your door. 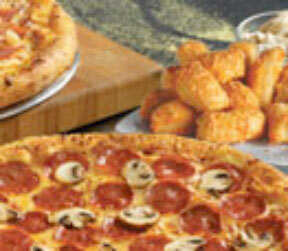 Check out our Hawaiian, Deluxe, Pepperoni Feast, or BBQ Chicken Feast pizzas today. Better yet, call or order on the mobile app to have pizza ready to pick up after a baseball game at Memorial Park fields. Both convenient and delicious!